Meta search engine Joblift analysed the UK’s insurtech job market, comparing it to both the traditional insurance industry, and the insurtech market in the UK’s major competitor Germany. 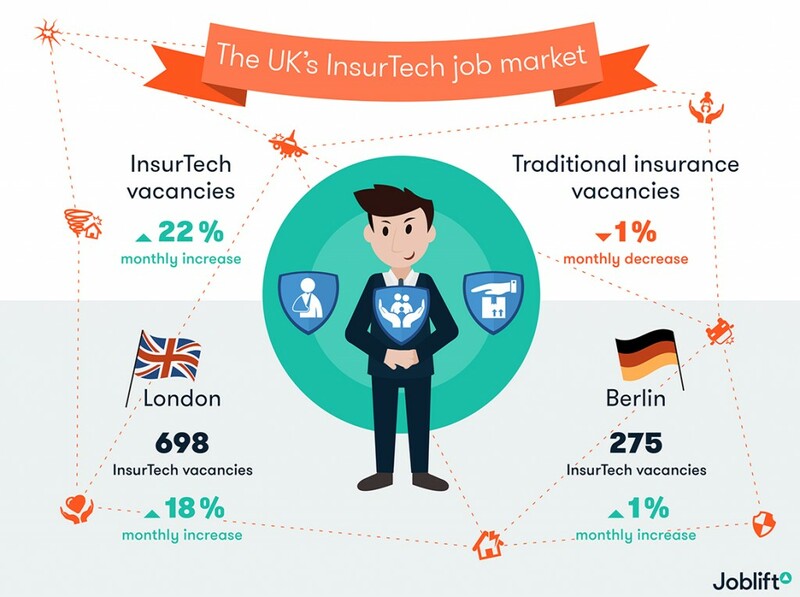 According to the findings, 913 insurtech vacancies have been posted in the UK in the last 12 months. Despite this small number, these positions have seen a huge average monthly increase of 22%, this in comparison with a growth of 1% monthly in the UK job market as a whole. Unsurprisingly, London was home to the most insurtech vacancies in the past year. However, with the capital holding 76% of all positions posted, the city’s dominance is substantial. In fact, London has been the location of almost 50 times more insurtech roles than second place, Manchester, which held 2% of all vacancies. Thanks to tech company Funds-Axis’s Belfast operations hub, the Northern Irish capital ranks in third place, despite also holding just 2% of insurtech vacancies. Making up 12% of all vacancies, web developers and analysts were the most sought-after insurtech professionals in the last year. Ranking in second place, programmers made up 9% of all postings, with consultants rounding off the top three with 8%. When comparing the insurtech job market with that of traditional insurance vacancies, it becomes apparent just how great an impact the disruptive finance sector is becoming. Whilst traditional insurance has advertised 75 times more positions in the last 12 months than insurtech, the sector has actually decreased on average by 1% each month. In addition, top professions differ when comparing the two. While tech vacancies reign supreme in insurtech, insurance handlers (9%), financial advisors (8%) and accountants (5%) make up the most sought-after traditional insurance roles, implying these positions may be a risk in the new insurtech market. Berlin’s rapid growth on the start-up market has seen the German capital emerge as the main competitor to London, and the insurtech capital of Germany (despite Frankfurt’s financial dominance, Berlin holds 65% of all insurtech vacancies). However, Joblift’s research shows that London outdoes Berlin in terms of number of jobs and average monthly increase. Over the last 12 months, London has been the location of 698 insurtech vacancies, 2.5 times more than Berlin’s 275. Additionally, the UK capital’s average monthly growth of 18% trumps Berlin’s 1% significantly, suggesting that confidence still lies with London when it comes to insurtech. On a wider scale, Germany’s insurtech job market as a whole has seen an average monthly increase of 10% in the last 12 months, less than half the rate of the UK’s insurtech market in the same period.